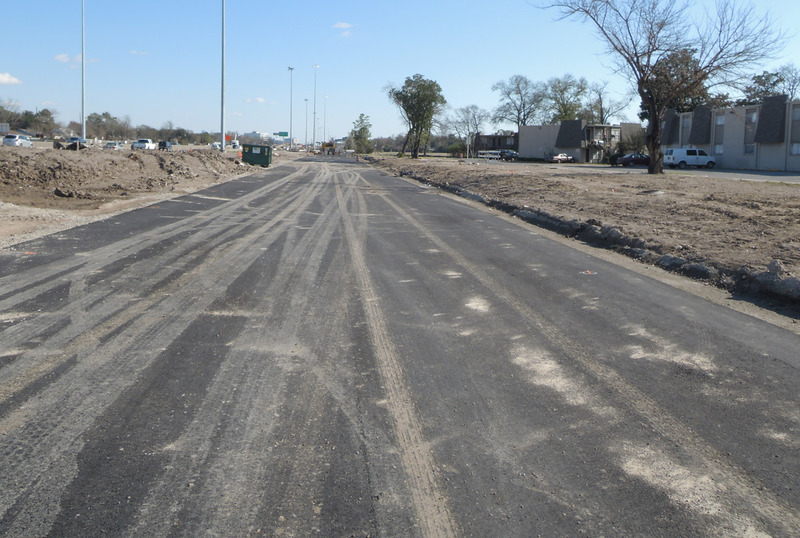 The $2.4 billion US 290 expansion is the largest highway construction project in Houston in the 2013-2017 period. (The Grand Parkway sections F and G is longer at 38 miles long but costs less, $1.1 billion). 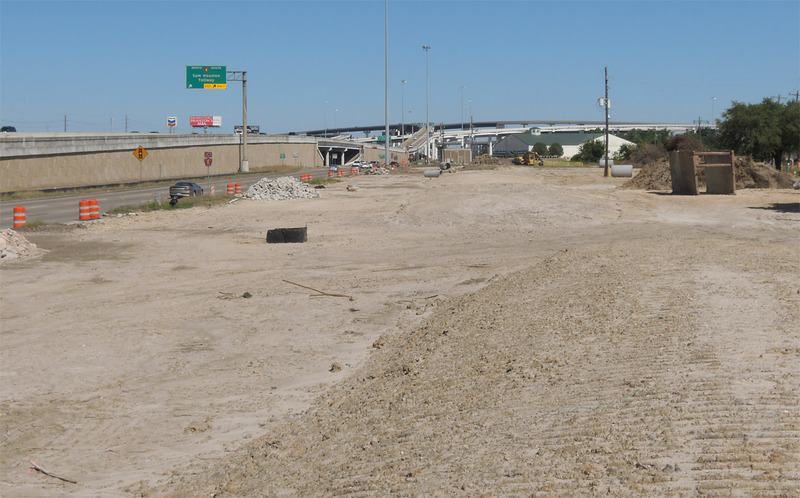 TxDOT attempted to minimize the right-of-way acquisition for US 290 after the huge and costly clearance needed for the Interstate 10 West Katy Freeway expansion which completed in October 2008. 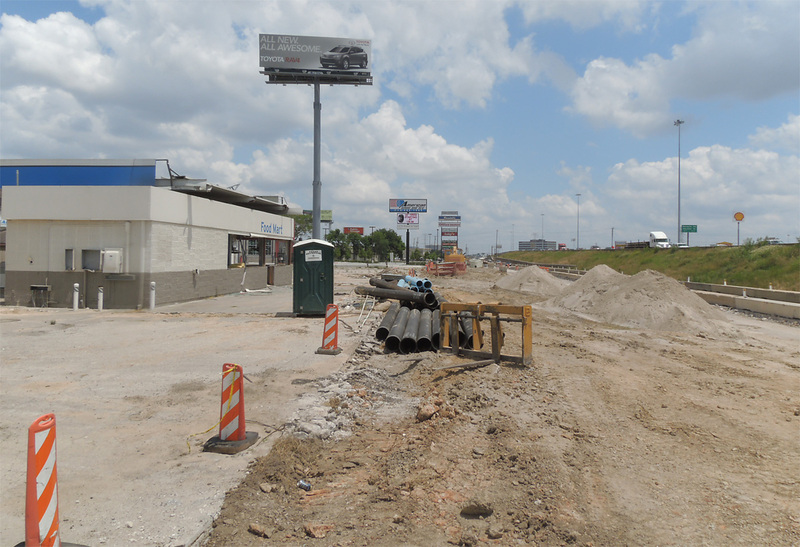 There are only two areas of substantial clearance in the US 290 project, the largest along Loop 610 where the interchange with US 290 is being expanded and a second area just west of the Beltway 8 interchange. 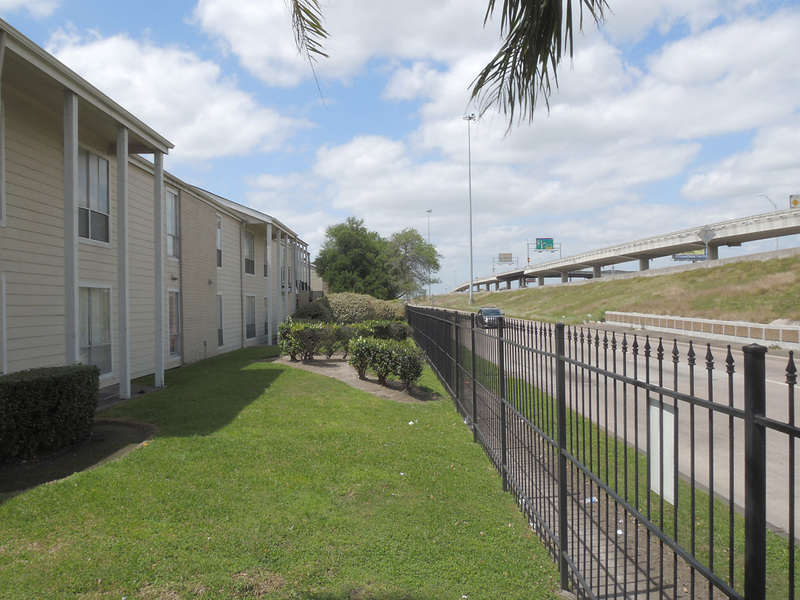 Between Loop 610 and Beltway 8, the clearance is generally a narrow strip less than 50 feet wide which requires some displacements but much smaller than the scale of the Katy Freeway expansion. This is the area with the most extensive clearance. 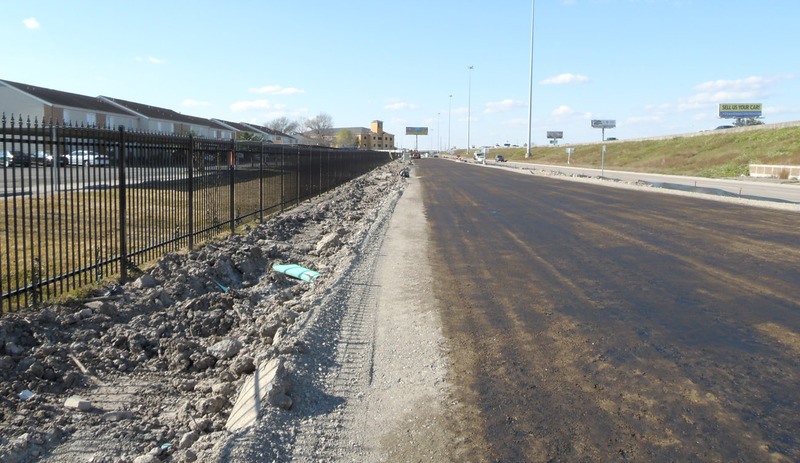 Between Interstate 10 and the US 290, about 0.8 miles long, a strip about 300 feet wide was cleared along the west side Loop 610. The buildings displaced were low-rise (mostly single floor) office buildings, warehouses and industrial structures. 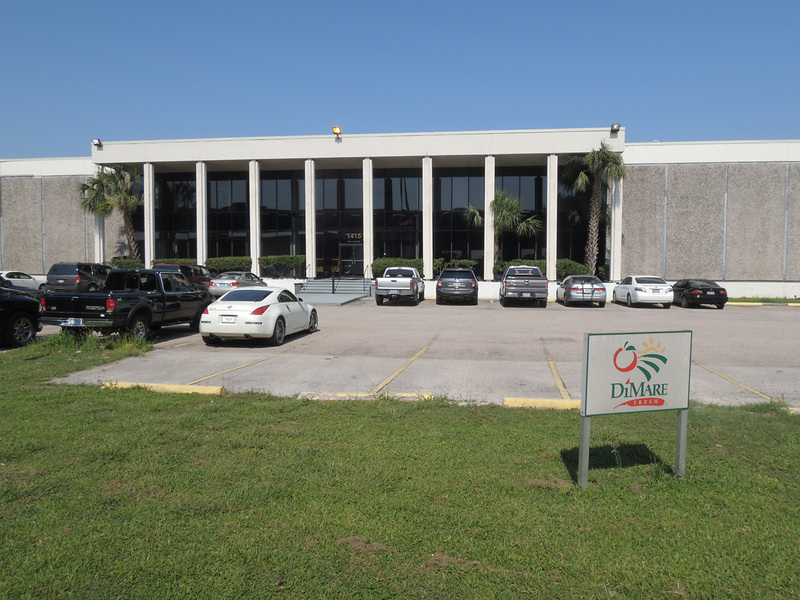 (25-June-2012) Looking southbound along the freeway with the Dimare office on the right. 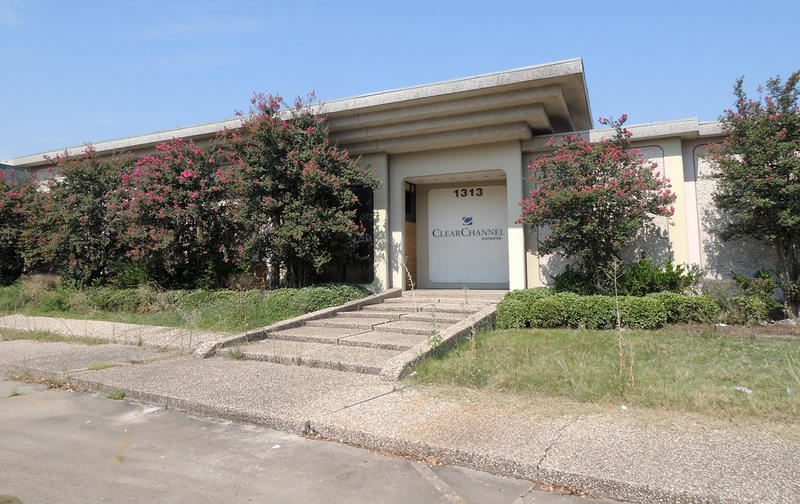 (25-June-2012) Just to the south was the Clear Channel office at 1313 West Loop North. The office was vacated with the door boarded-up when I took this photo. 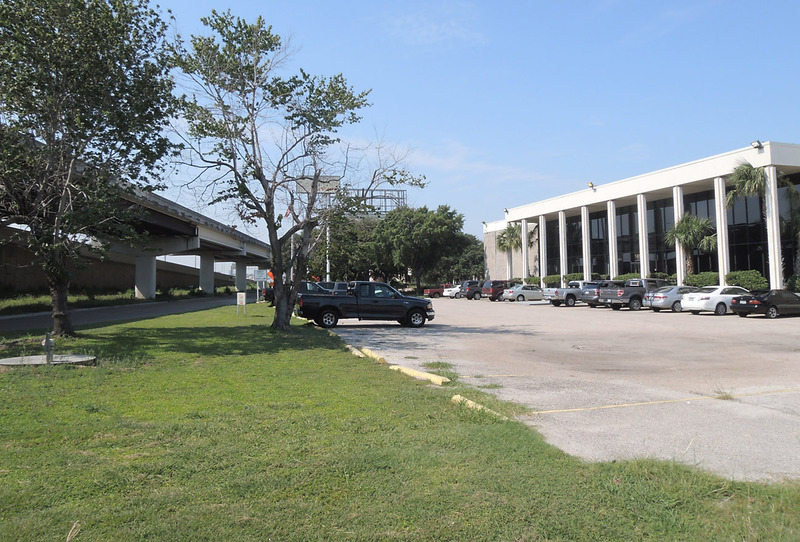 (25-June-2012) Continuing south, the ProLogis Post Oak office park was located along the freeway. OCTOBER 2014 UPDATE: The elevated structure shown in this photo, which was the HOV lane structure, was demolished in September 2014. 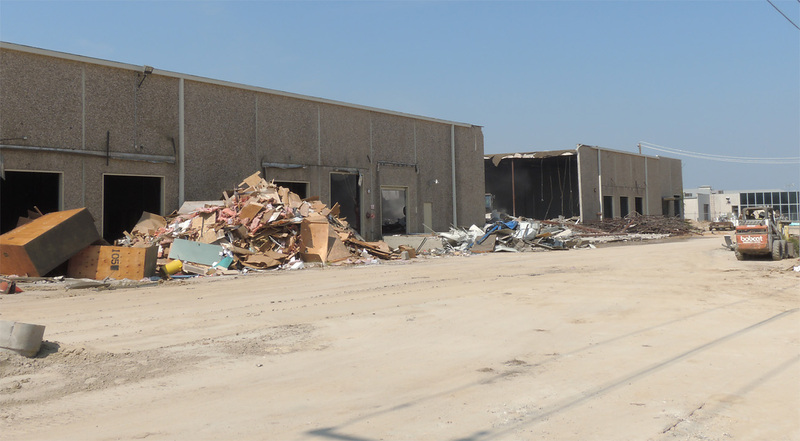 (25-June-2012) This photo shows one of the ProLogis buildings reduced to rubble. (25-June-2012) Another view of demolition nearing completion. 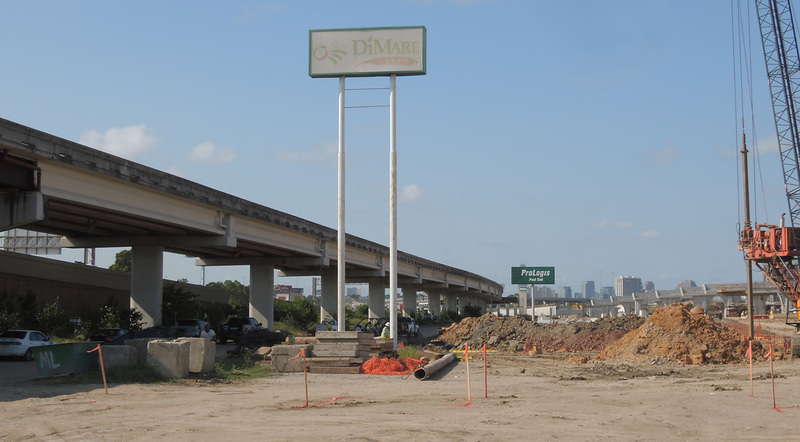 (13-July-2013) This July 2013 view shows the Dimare and Prologis signs still standing alongside the freeway even though construction had progressed on the right. 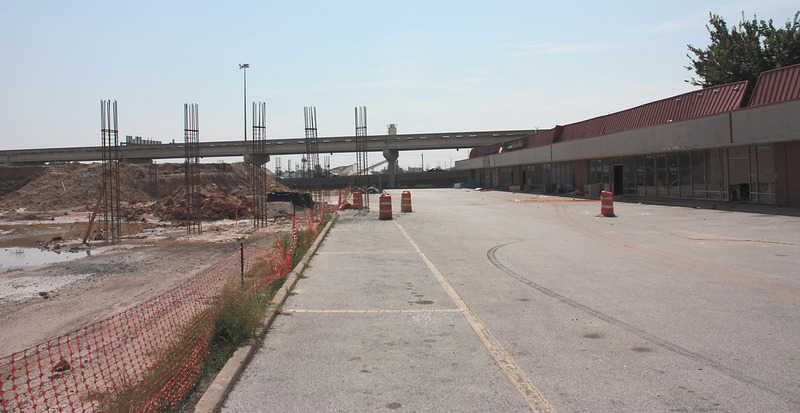 OCTOBER 2014 UPDATE: The elevated structure shown in this photo, which was the HOV lane structure, was demolished in September 2014. 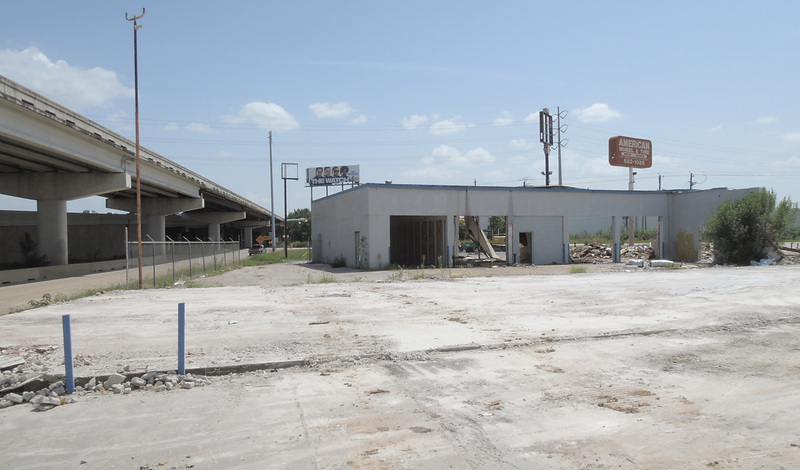 (25-June-2012) There were other structures in the clearance zone including this warehouse along West 12th Street. I took this photo while demoliton was in progress. (25-June-2012) Another view of the warehouse along West 12th. 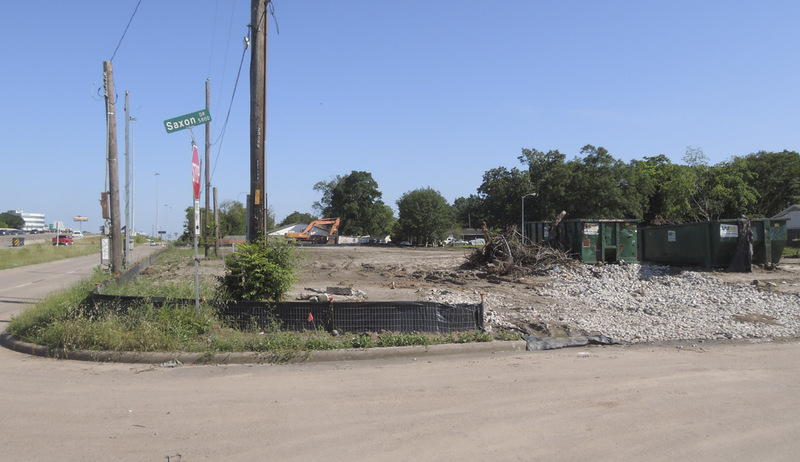 (22-September-2012) The foreground shows a cleared property. 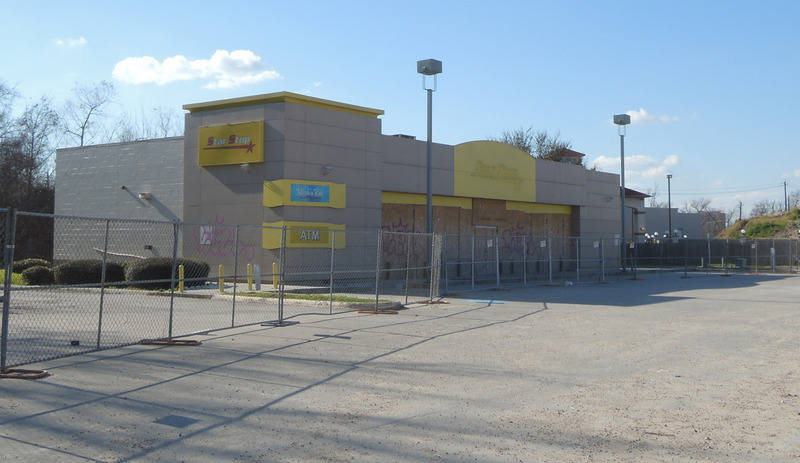 On the right is a building awaiting demolition. 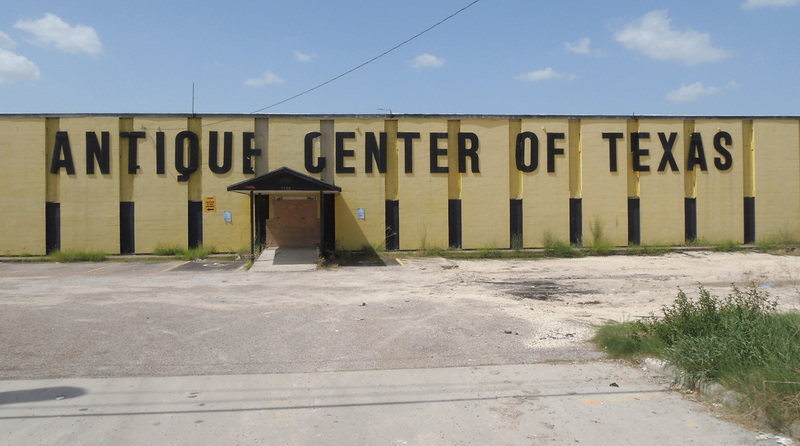 (28-July-2012) The Antique Center was a large retail building at the northwest corner of Old Katy Road and the West Loop. Its entrance faced Old Katy Road. (28-July-2012) The new location was announced on the exterior. (2-March-2013) This March 2013 view looks north along the cleared corridor. In the distance (near Hempstead Road) one remaining building can be seen. 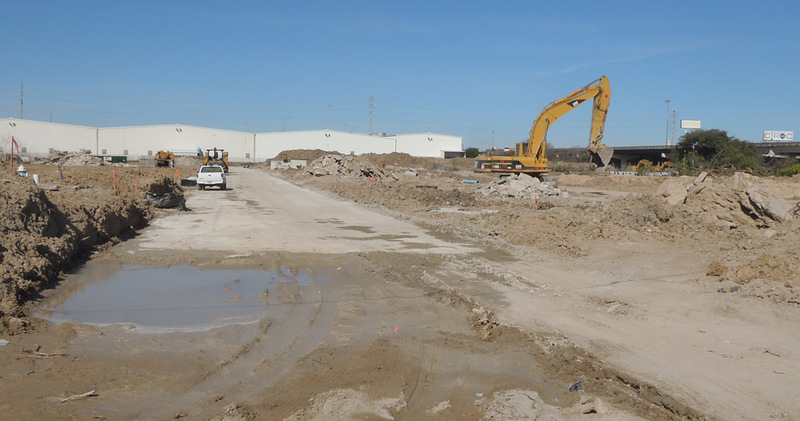 (3-Feb-2013) This view shows construction on the new southbound frontage road with the warehouse building in the background. It took a very long time to clear the warehouse - I'm assuming there was litigation in the condemnation proceedings. (7-April-2013) This April 2013 view shows the frontage road open to traffic but the structure still blocking the freeway path ahead. 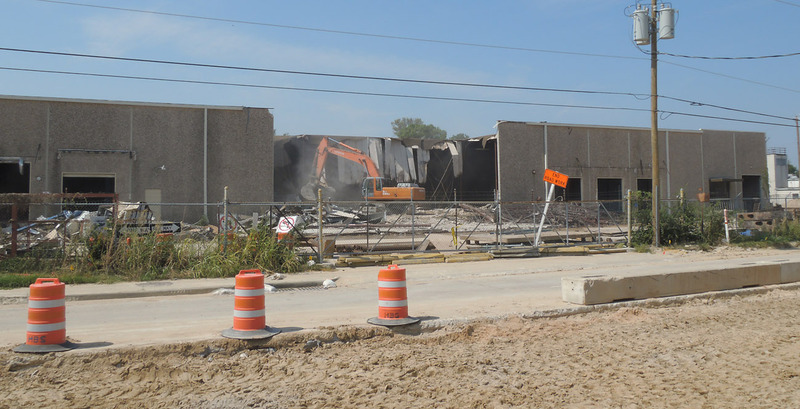 The building was gone by the end of 2013. 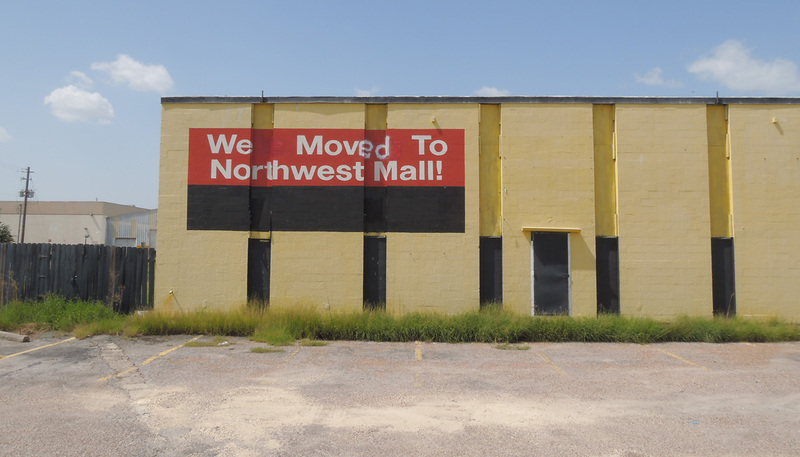 Northwest Mall, at the Intersection of US 290 and Loop 610. 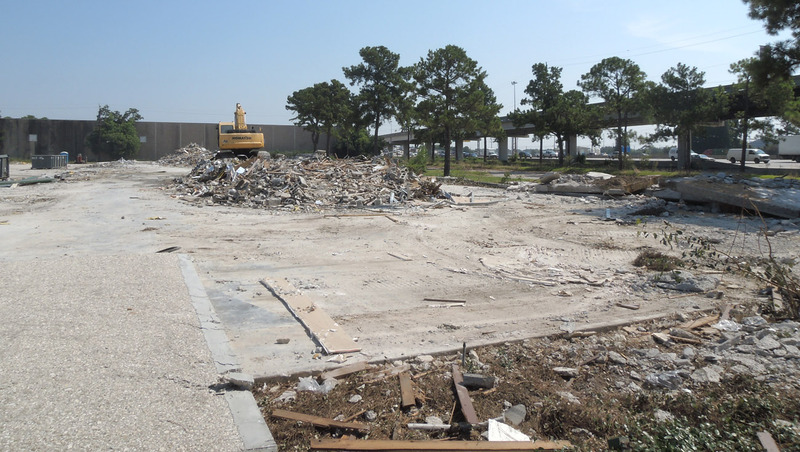 The structure of Northwest Mall was unaffected, but Northwest Mall did lose a wide swatch of its parking lot. 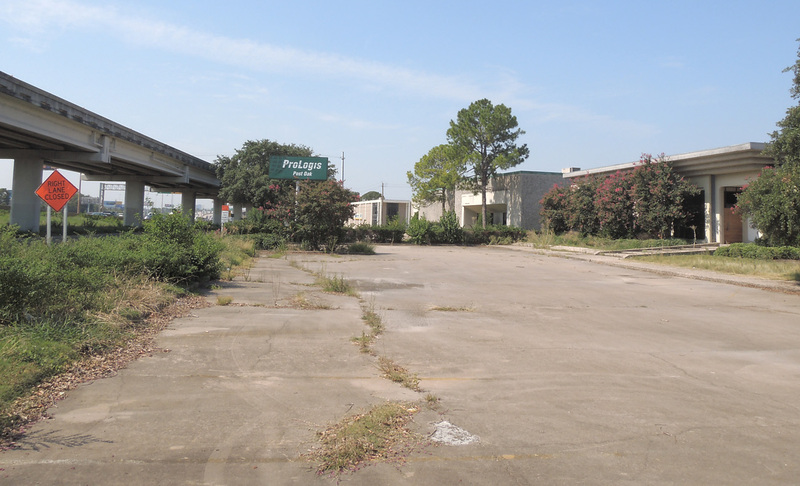 Properties alongside the freeway at Northwest Mall were cleared. 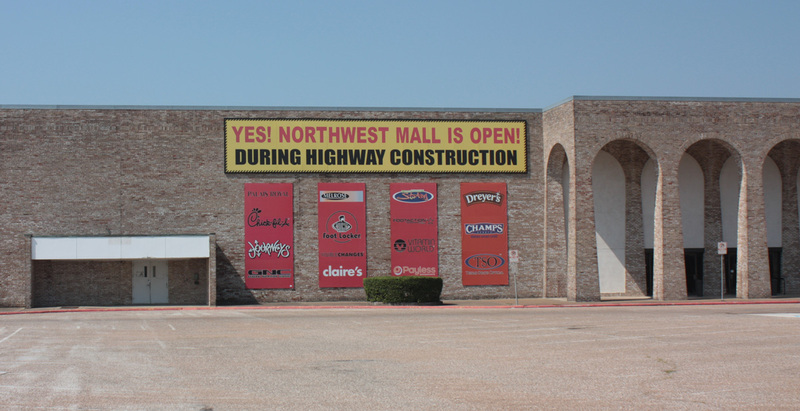 The mall was decorated with a sign announcing that it was open during construction. 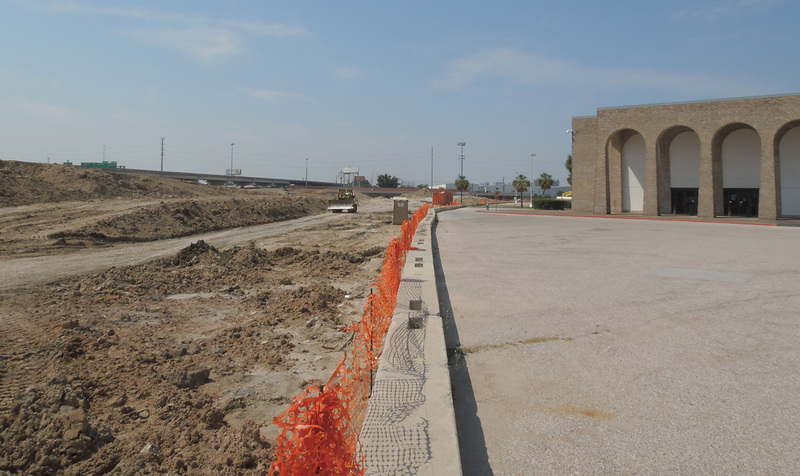 (28-July-2012) The El Chapparal night club survived well after contruction began and the new frontage road was built very close to the structure. The building was later cleared. 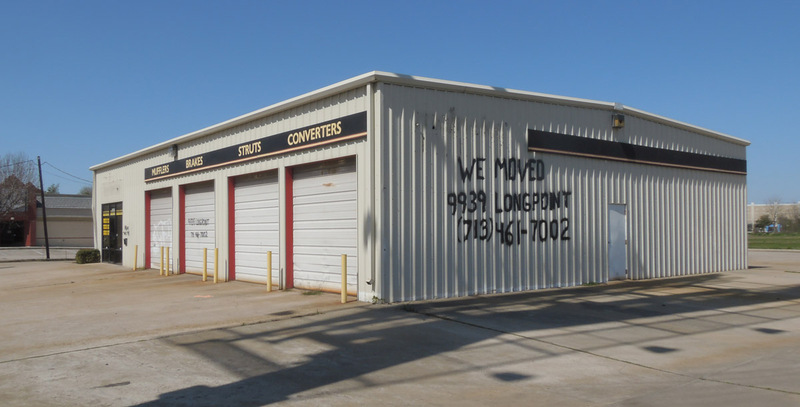 This strip center was located on the southeast corner of the Northwest Mall parking lot, which was the northwest corner of Loop 610 and Hempstead Road. 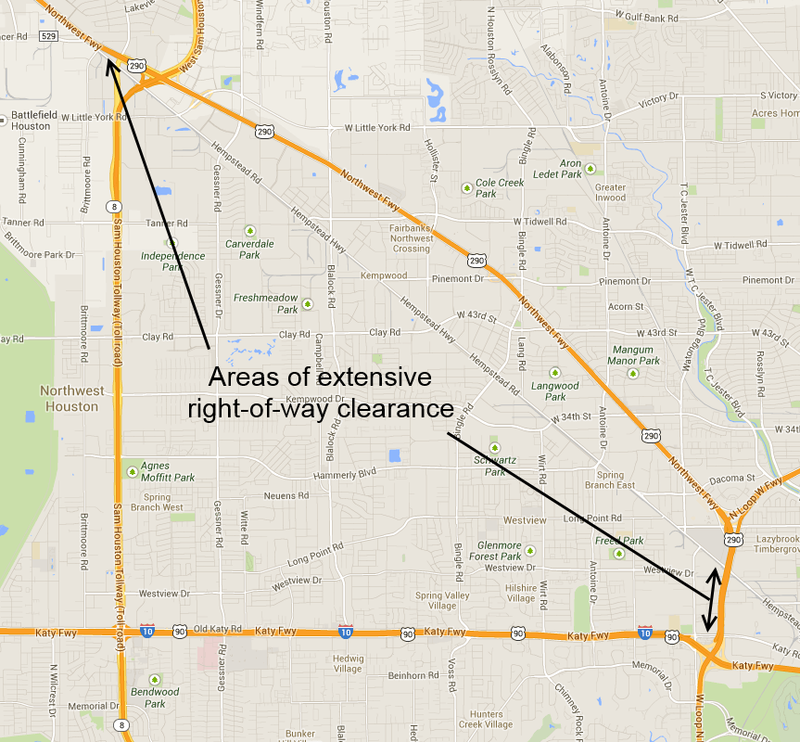 This view shows that the strip center came to the edge of the freeway right-of-way. 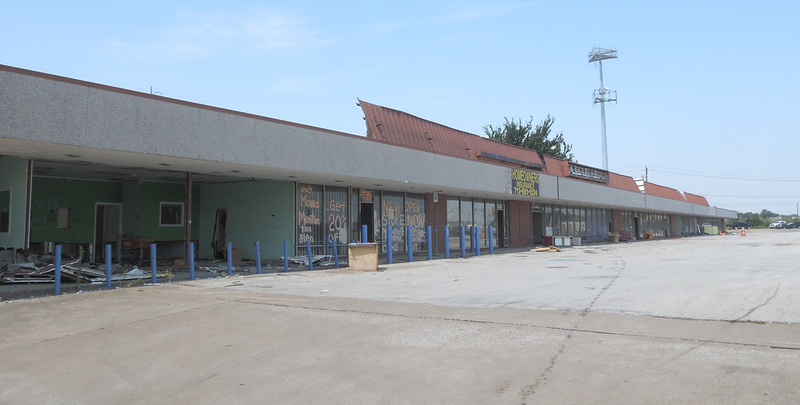 The entire strip center was demolished, including the far end well away from the freeway. 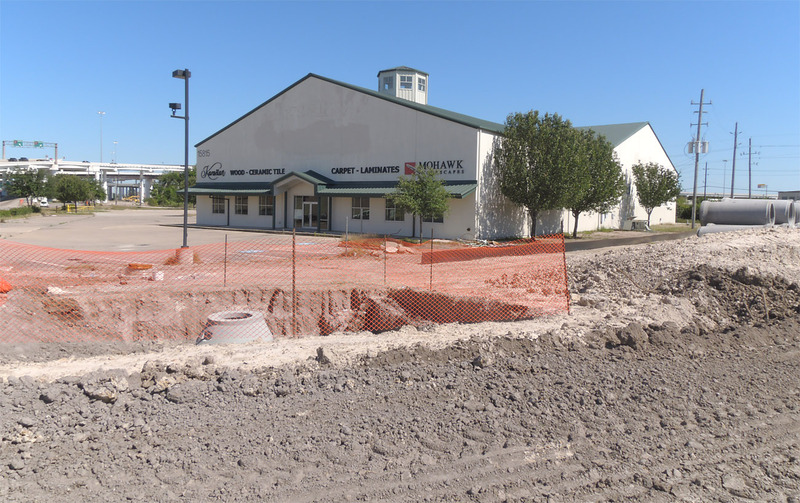 (25-June-2012) Here the rebar for a new bridge is encroaching on the strip center parking lot. 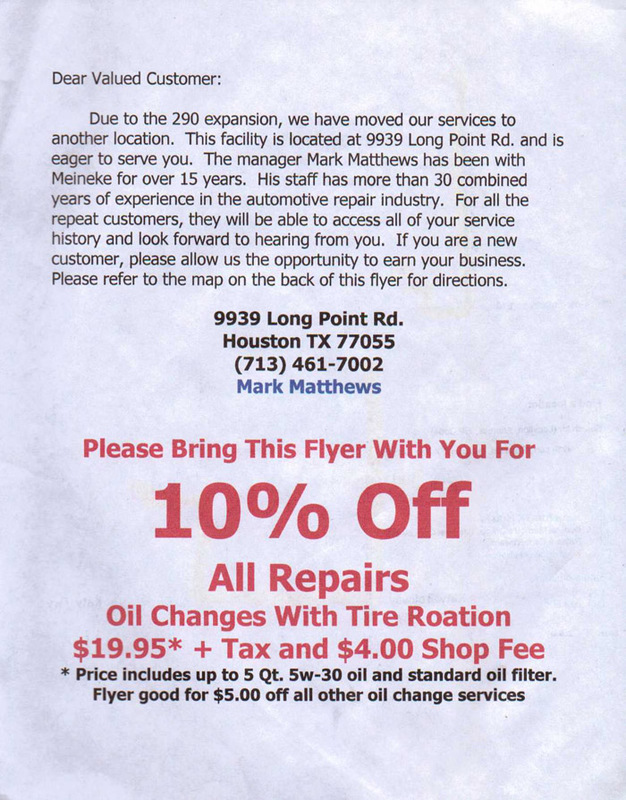 (28-July-2012) American Wheel and Tire was on the corner of Loop 610 and Hempstead Road. (28-July-2012) There was some nice grafitti on the interior walls of the building. 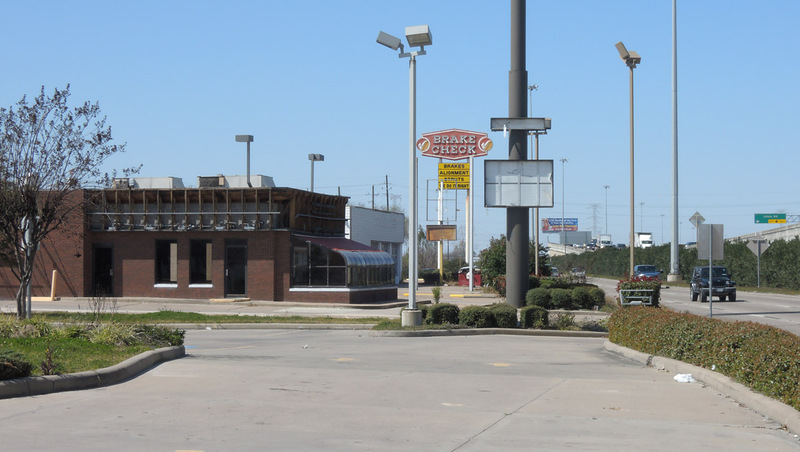 The fast food strip was located along the south side of US 290 just west of Beltway 8/Senate Avenue. There were also a couple car repair establishments on the strip. Three structures on the north side of the freeway were also cleared. 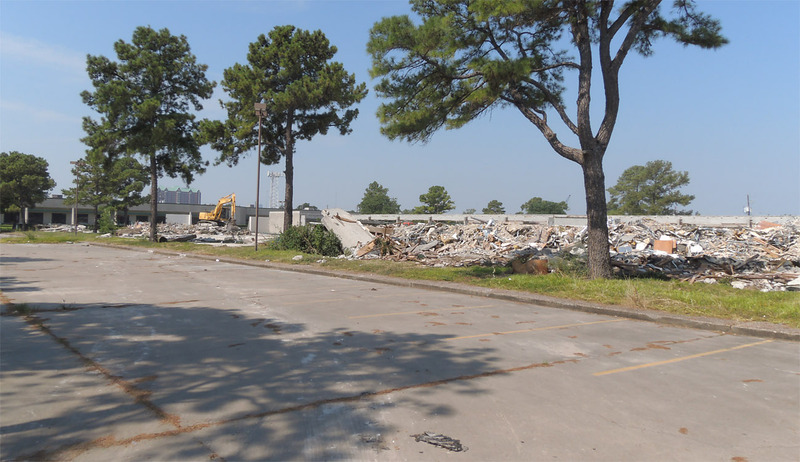 (2-March-2013) This view looks west along the eastbound frontage road showing the numerous buildings awaiting demolition. 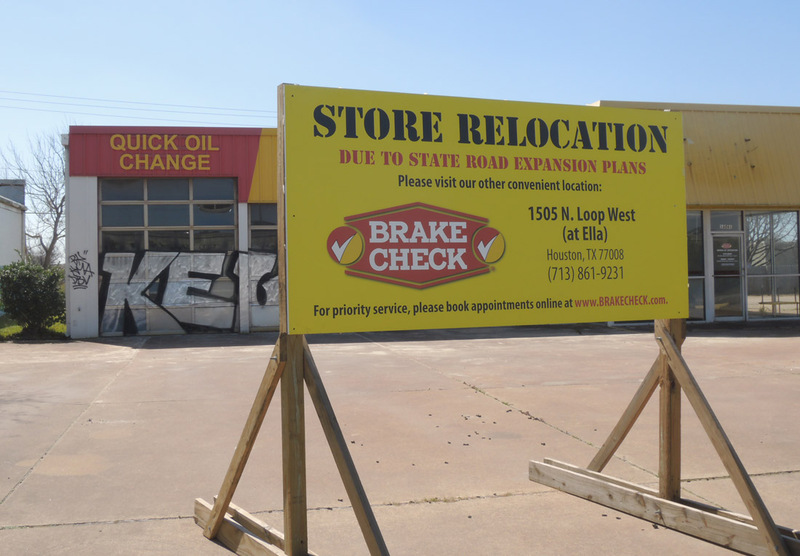 (2-March-2013) This sign announces the relocation of the Brake Check. (2-March-2013) Another view of the Brake Check. 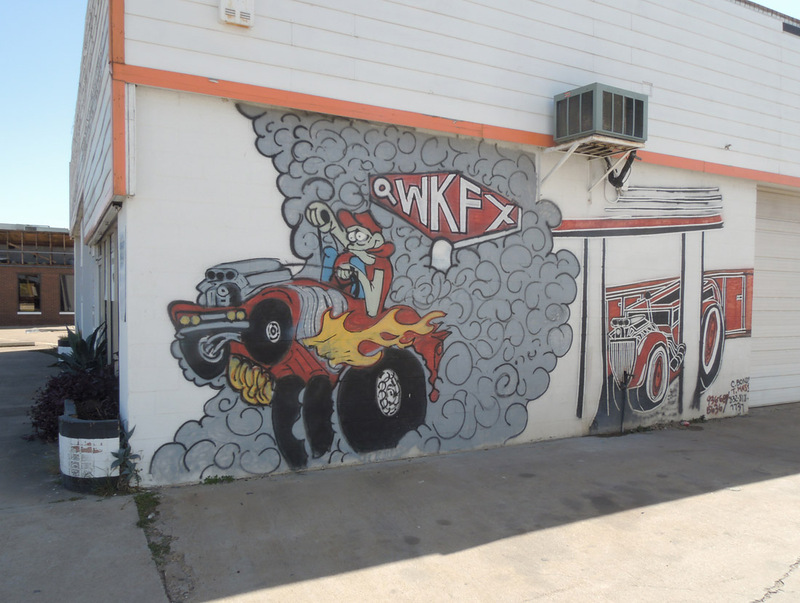 (2-March-2013) This building, which I think was an auto body shop (maybe Collision Center), had some nice artwork. 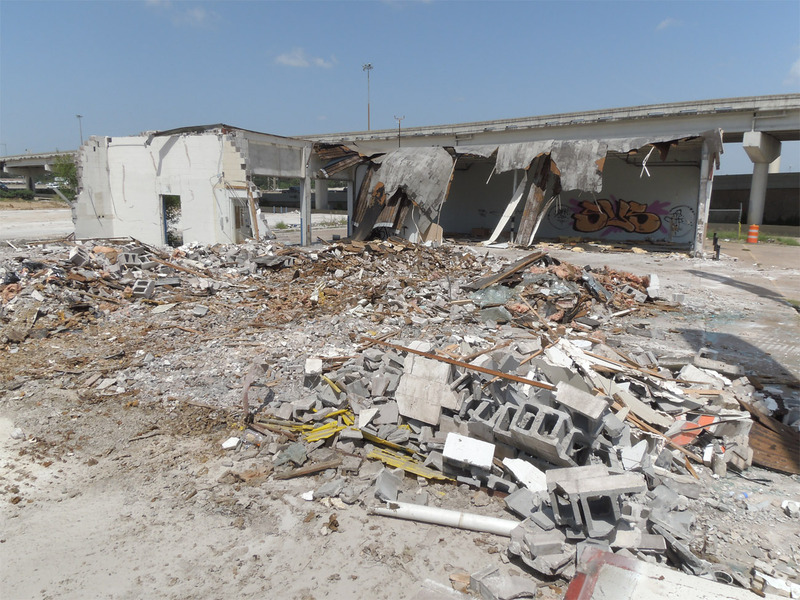 (5-May-2013) Two months later in May 2013 all buildings were cleared. This view looks east with the Beltway 8 interchange in the distance. 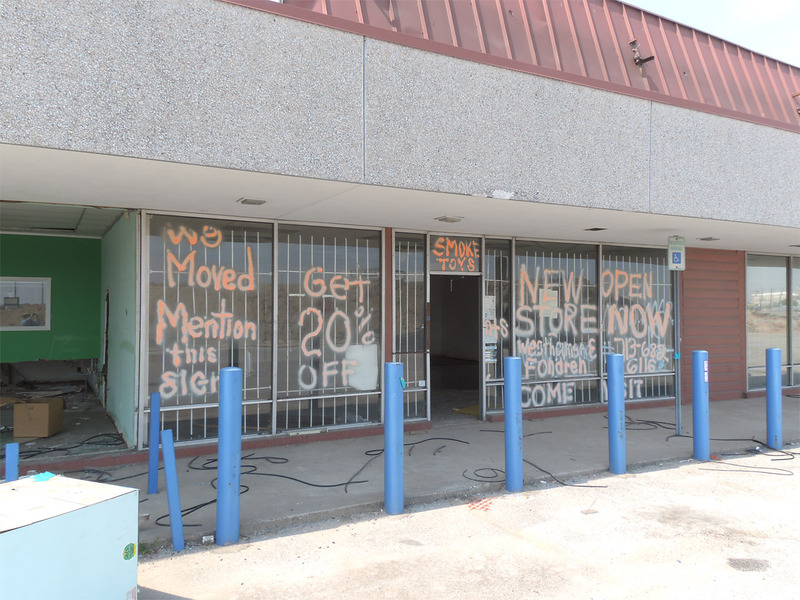 (5-May-2013) East of Senate Avenue was this carpet retailer. (5-May-2013) Another view of the carpet retailer. It was cleared soon after I took this photo. 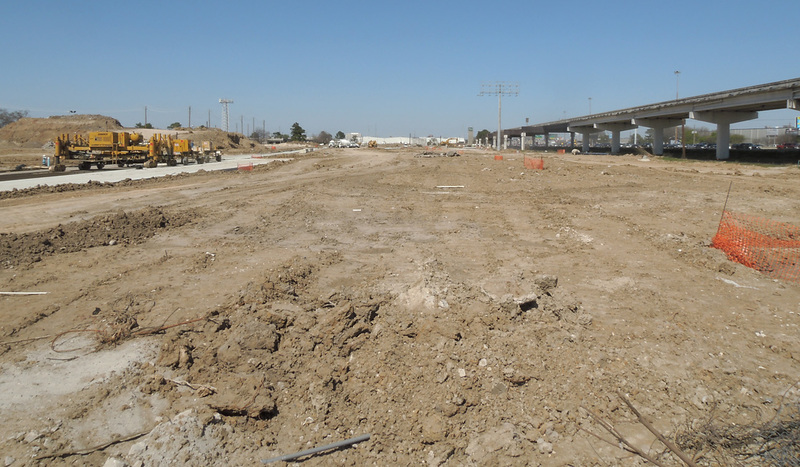 (2-March-2013) This view looks west along the westbound frontage road on the north side of the freeway just east of Senate Avenue. 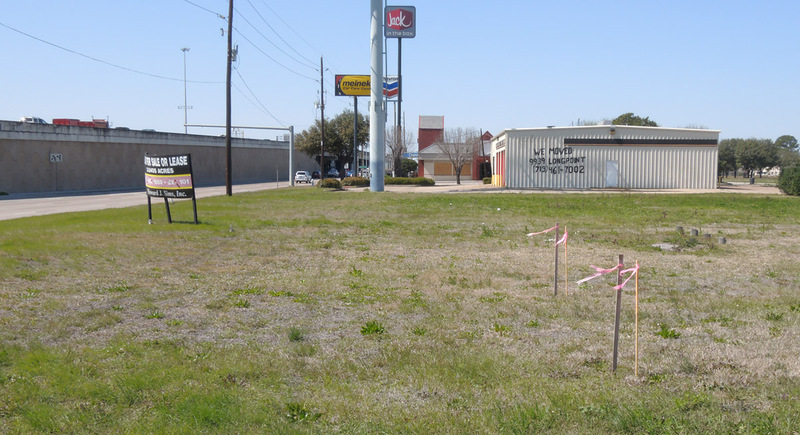 We can see the right-of-way markers, with a Meineke muffler shop ahead and a Jack-in-the-Box behind the Meineke. 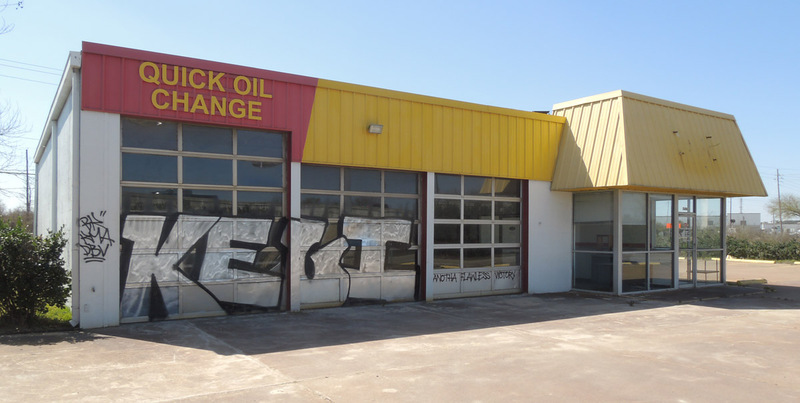 (2-March-2013) The spray-painted message on the wall shows the new location. (2-March-2013) Near the entrance door, these sheets were available to get a discount at the new location. 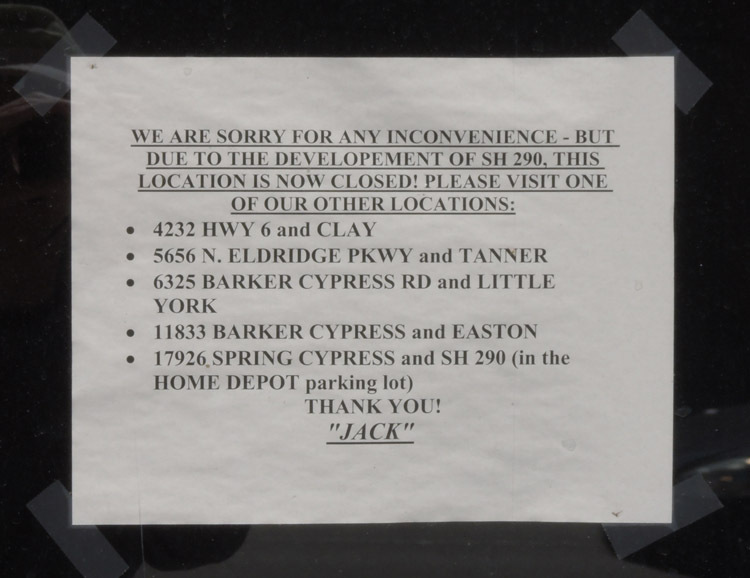 (2-March-2013) Jack left a message for his customers. 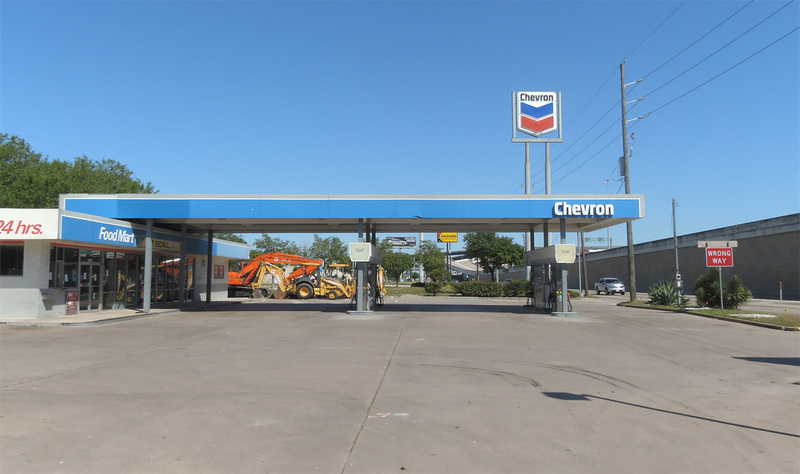 (5-May-2013) The Chevron on the northeast corner of US 290 and Senate Avenue was closed when I took this photo in May 2013. 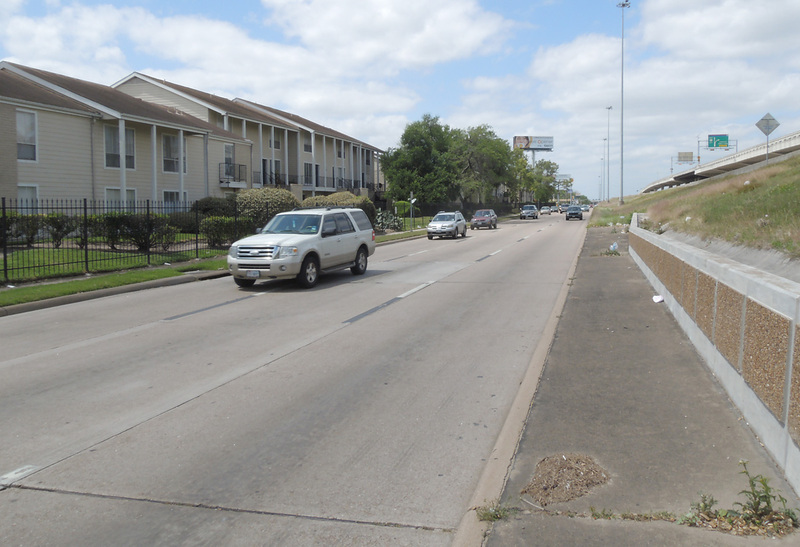 A narrow strip was typically acquired along the freeway. Structures that were very close to the frontage road had to be cleared. 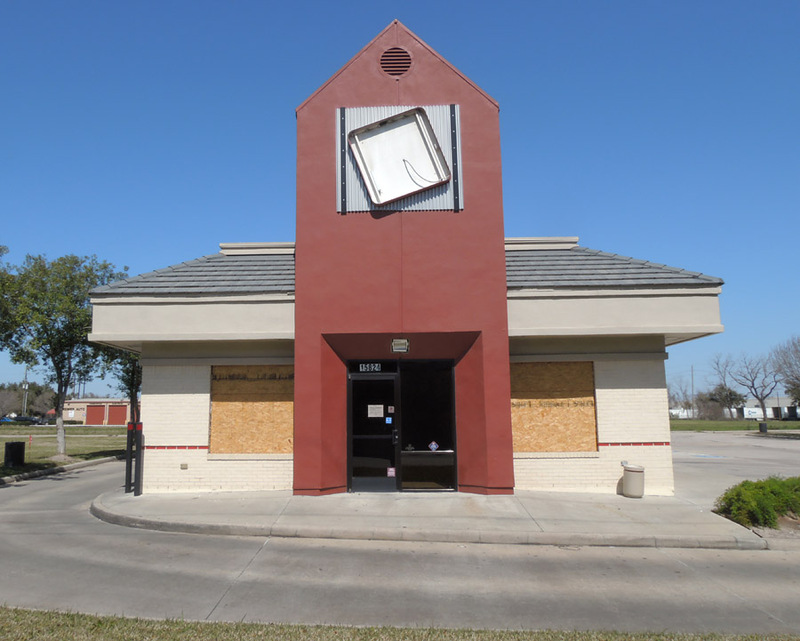 (7-April-2013) This Chevron fuel station at 11404 Northwest Freeway, just east of Antoine, was too close to the frontage road and had to be cleared. (27-May-2013) This is how it looked a month later on May 27. The width of the right-of-way needed was only about 30 feet. 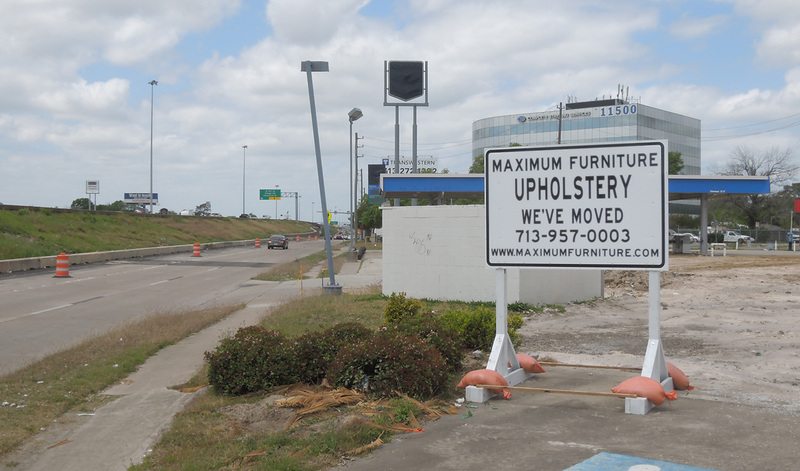 (7-April-2013) There was a Maxim Furniture Upholstry next to the Chevron. This sign announces its relocation. (7-April-2013) This apartment building on the south side of the freeway just west of 43rd Steet is slated for demolition. As of December 2013 it was still intact. 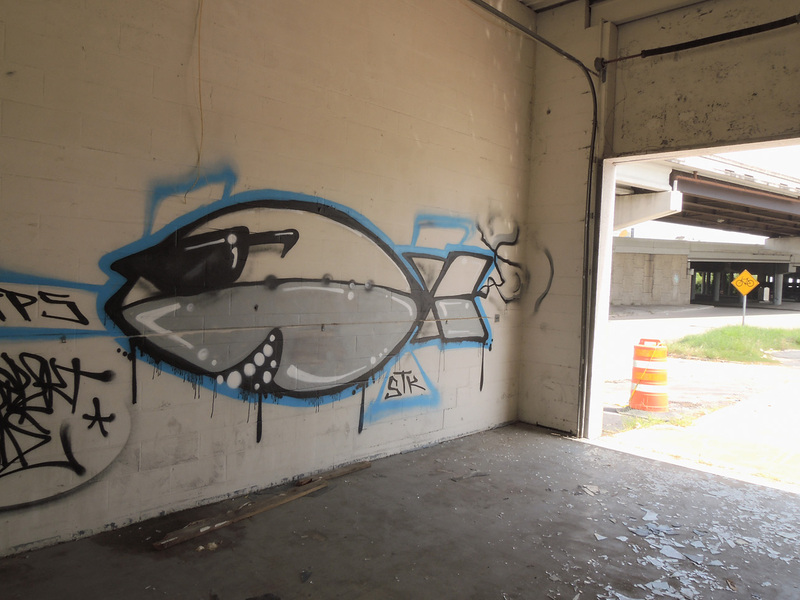 August 2015 UPDATE: This building was cleared in August 2015, see two photos down. (7-April-2013) Another view of the apartment building to be cleared. The elevated HOV lane access structure visible on the right was permanently removed during the expansion. 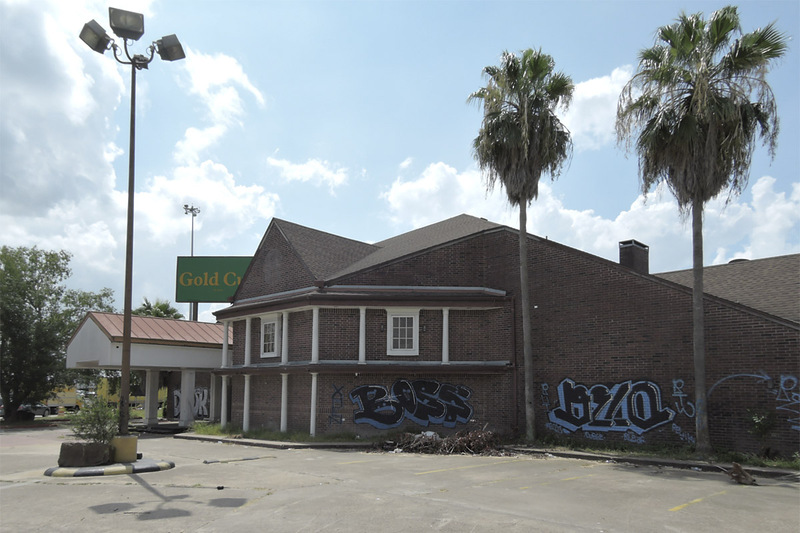 August 2015 UPDATE: This building was cleared in August 2015, see next photo. 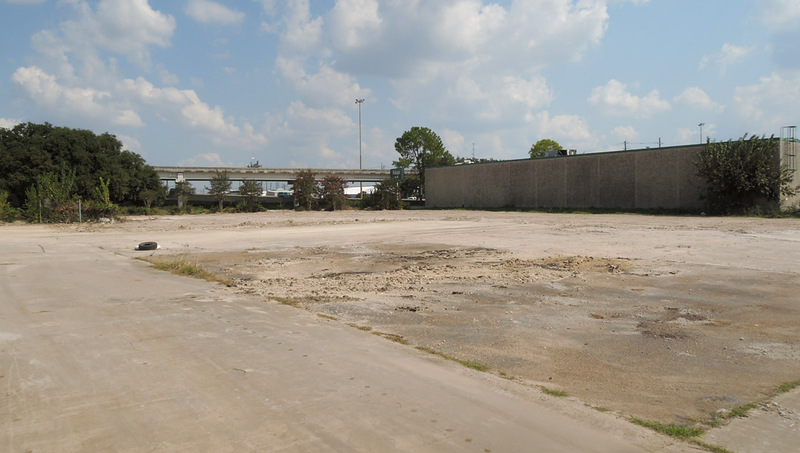 (29-August-2015) The apartment buildings alongside the freeway were cleared in August 2015, here is a view looking along the feeder with the brownfield where the building existed. 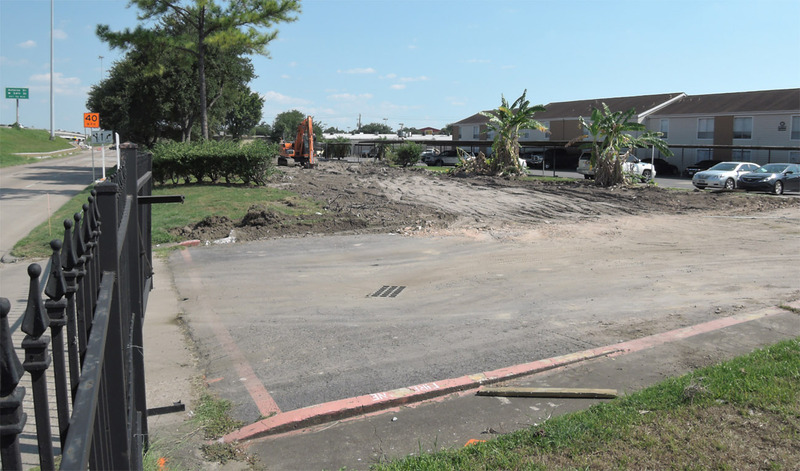 (6-Feb-2015) In February 2016 the frontage road base was in place on the former location of the apartment building. 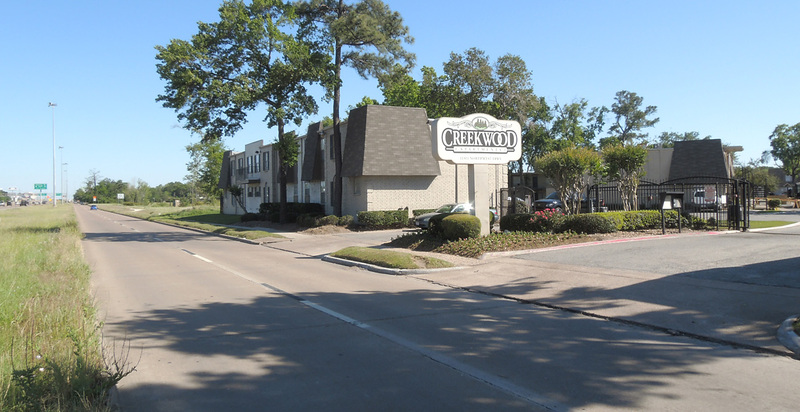 (5-May-2013) The Creekwood Apartments at 11911 Northwest Freeway had one building immediately alongside the frontage road. It is slated for removal but was still intact in December 2013. 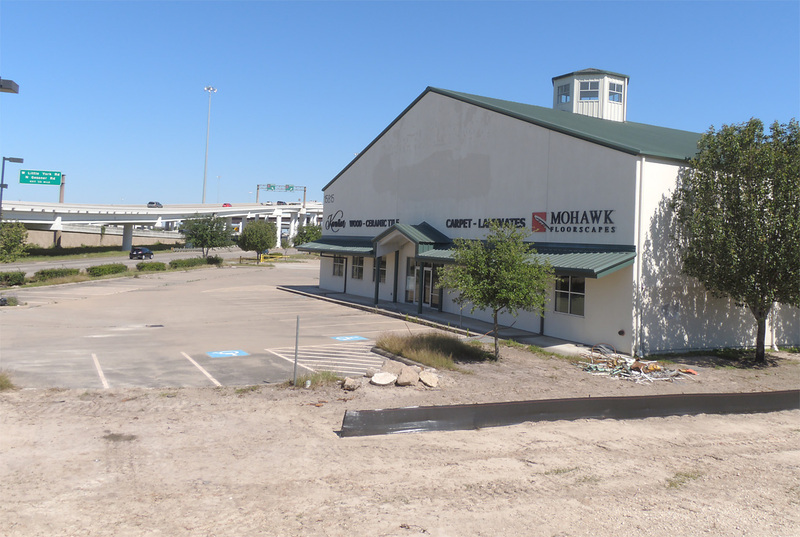 September 2015 UPDATE: This building was still intact in early September 2015 but was being readied for clearance. 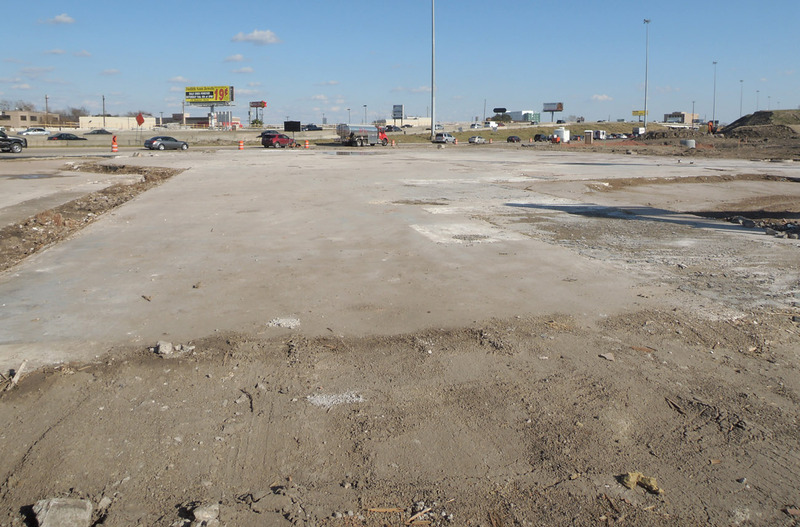 (6-Feb-2016) In February 2016 the property was cleared and the base for the eastbound frontage road was in place. 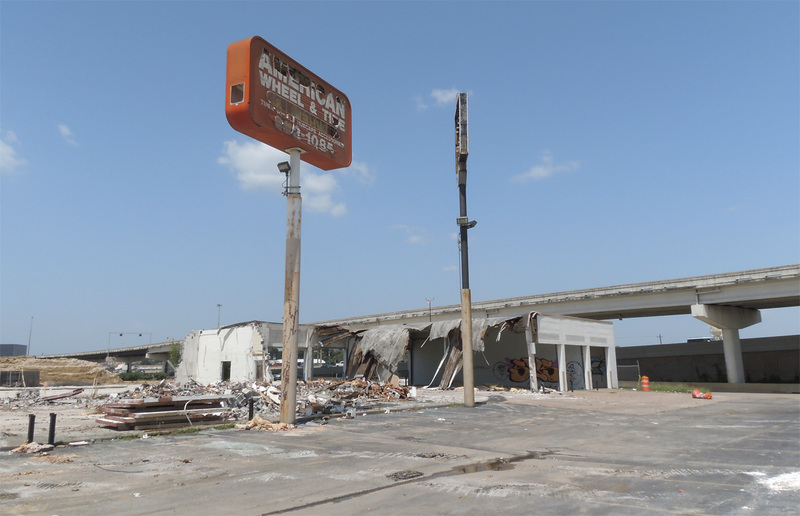 (5-May-2013) The only single-family dwellings to be displaced are along Harland Street on the south side of the freeway. 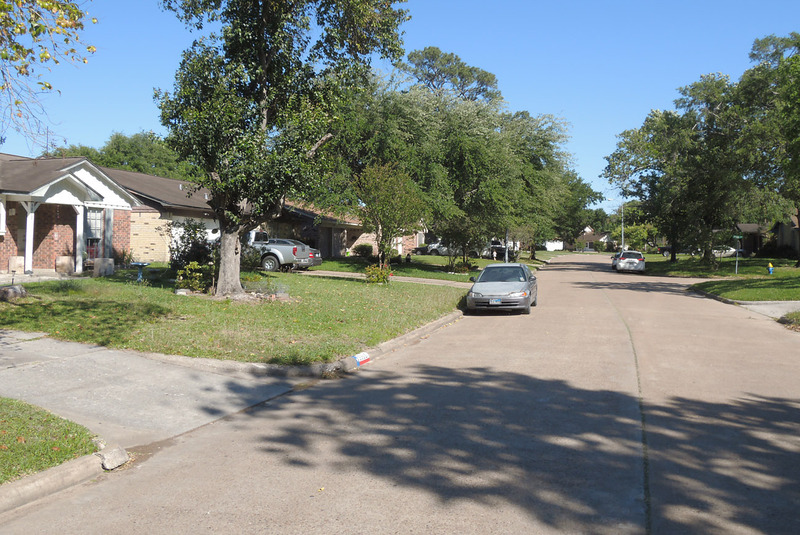 Nine homes on the left side are slated for demolition. (25-April-2015) In April 2015 most of the homes were cleared. 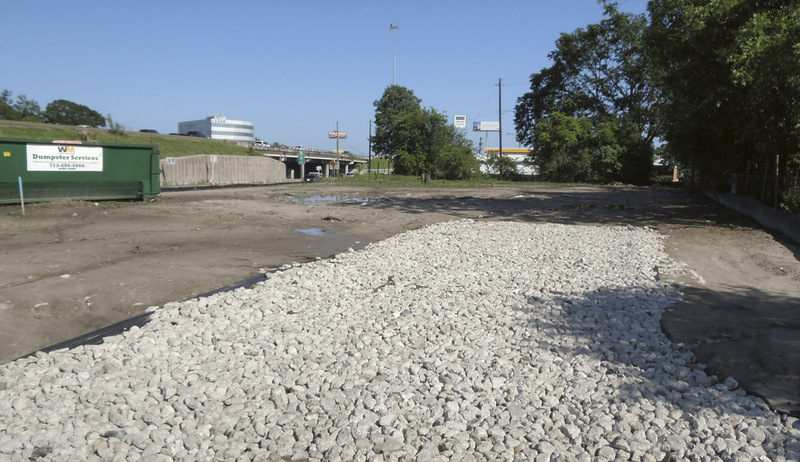 (25-April-2015) Cleared lot in April 2015 with the Antoine overpass in the background. 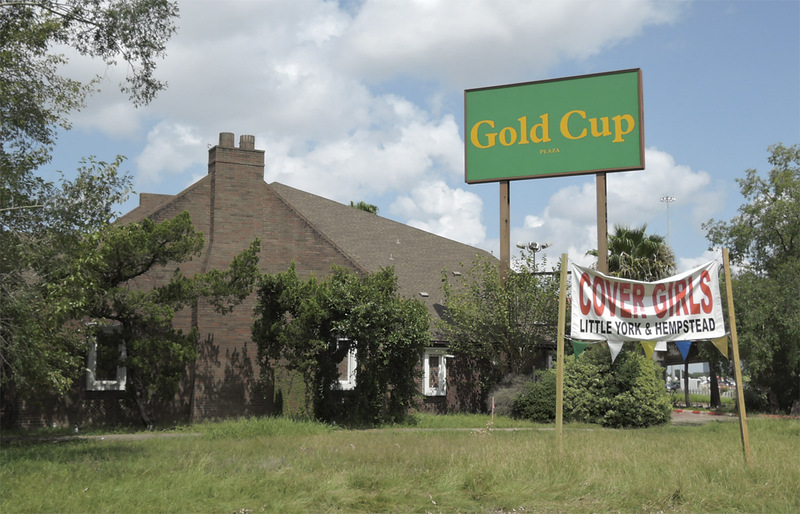 (21-July-2015) The Gold Cup gentlemen's club at Pinemont remained operational after construction started, but by July 2015 demolition was imminent. The banner indicates that the operation moved to the Cover Girls club. (21-July-2015) Entrance to the Gold Cup. 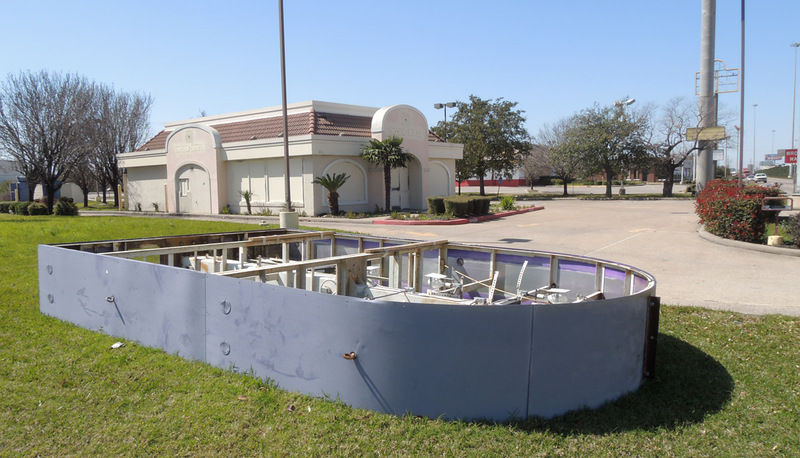 (6-Feb-2016) In February 2016 the structure was cleared and only the slab remained. 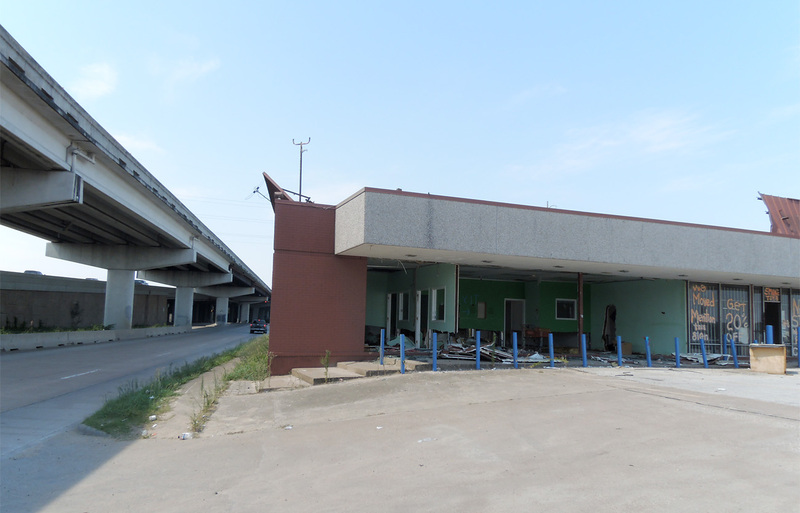 (6-Feb-2016) This convenience store and fuel station at the southwest corner of Bingle and the freeway was boarded up in 2016. 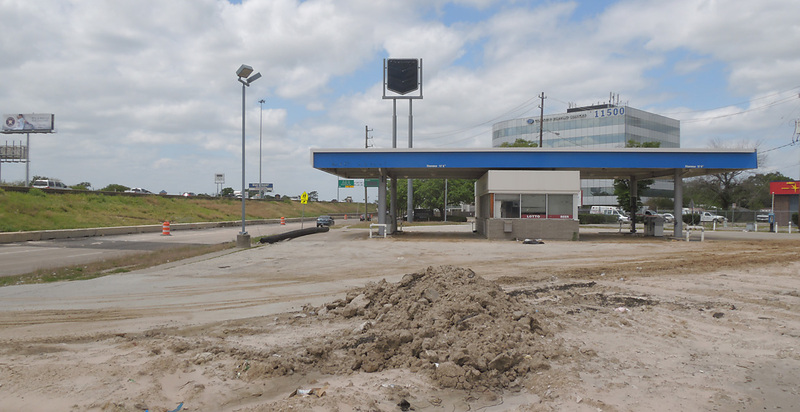 Although the fuel pumps were displaced by the widening, the structure was far back from the new right-of-way line. 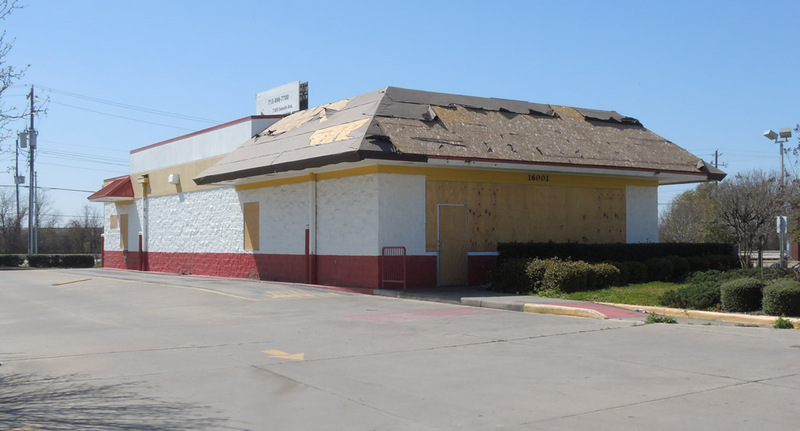 I don't know if this building is slated for demolition, or if it is closed during construction and will reopen when work is done.